We all like to travel a little differently. Some like to laze the hours away sipping on a cocktail on a tropical island, while others like to explore the mysterious unknown of historical ruins. Some even like to risk their lives clamouring through almost-untouched jungles or hurling themselves off a bridge above some of the world’s most breath-taking waterfalls. All of these adventures are reason enough to book Mango flights and get ready to set off to the next exciting destination in South Africa, but how do you choose which one to do first, if the adventures happen to be overseas? Some of the travel gurus you see on TV will insistently tell you to head on over to the “firm favourites” of the world. But what if you had the choice (or knowledge) to do something a little different. What if you could travel to one of the world’s best places, that has just never been on your radar before? With so many exciting destinations to head off to, it can seem a little overwhelming when trying to choose where to go. While Mango flights will get you around South Africa and even as far as Zanzibar, you’ll need to browse online to find the cheapest international flights. And before you do, take a look through our list of top 10 places to visit in 2019. We even include a few reasons why. Yip, Ghana…beautiful Ghana is on the very top of our list. And it’s right where it should be. Ghana is a country that doesn’t get nearly enough credit as a travel destination. The Cape Coast Castle towering over the sea, where slaves were held until traded, is just the start to the interest that this country has to offer. The country has a dark history that’s worthy of investigation. While there, don’t miss the nightlife in Accra (the capital city), the great surfing spots on the 335-mile coastline, the Whistling Rocks in Tongo village, and the Mole National Park where wildlife and nature abound. Many think that Scotland is all soft sand dunes, dangerously rugged mountains, castle ruins, bagpipes and crystal-clear waters, but there’s more…there’s the Hebridean islands too. Get up close and personal with the Stonehenge display at Gallanish, visit the many whisky distilleries, stroll along the beaches, and delight in the scenery that will take your breath away. Ever thought of going on a sabbatical to India? Head on over to Kerala. Kerala is charming both in its wildlife and local culture. Visitors can stay in houseboats (called “kettuvallam”), feast on authentic Indian cuisine, and spend many hours soaking up the sunshine and sea breeze. Must-see spots include the Munnar tea plantations and the Periyar National Park to name a few. The area is aptly nicknamed “God’s Own Country” and the only way to truly find out why is to book your flights to India and see for yourself! This little country (the sixth smallest in the world, in fact) with just 37 000 residents is found tucked in between Switzerland and Austria. It’s a charming little place that covers a land area of just 160 square kms. This is the perfect location to mountain bike, hike, and gaze out at the impossibly beautiful scenery. For those who like a little history, the castles and museums are unusuallyfascinating. There’s a lot more to Oaxaca than meets the eye. First and foremost, it hosts the Monte Alban which is a UNESCO heritage site with Columbian history. Visiting this Mexican area is an entire holiday package in one. Enjoy the local cuisine, explore the ruins, and browse the outside market places. The food in Oaxaca is somewhat of a novelty and is not to be missed! Many who visit here comment on the quaintness of the B&B scene, so don’t forget to check that out! This is only the second largest city in Bulgaria, but it’s becoming increasingly popular for those looking for something different. Here you will find Roman ruins, a mix of cultures, and many festivals to attend (especially in summer). Don’t forget to check out the city’s ancient theatre. There’s a lot of history in Weimar. Weimar was known for artistic freedom expressed in Germany between 1918 and 1933. 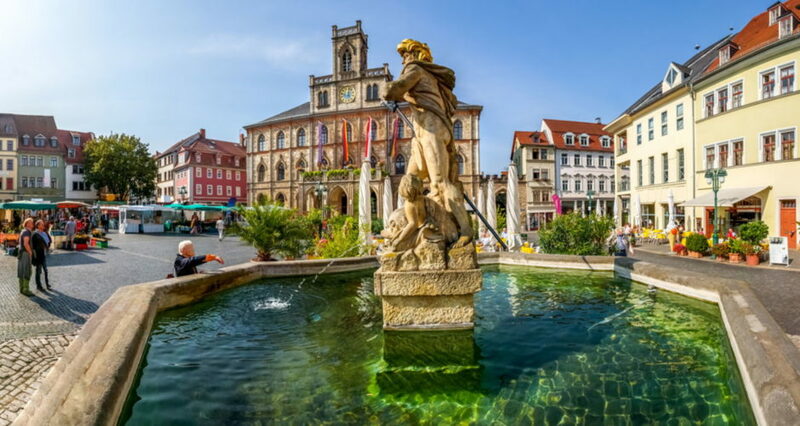 It’s considered to be one of the birth places of art and design and as such hosts art schools and universities that produce world-renowned artists and musicians, such as Franst Liszt and Johann Sebastian Bach. There are a number of UNESCO World Heritage Sites to check out here including Goethe House and Belvedere Castle. In 2017, Hurricane Irma struck the Caribbean and gave St. Barts a run for its money. Fortunately, the island is recovering nicely and is still the chosen playground for many of the rich and famous. Most travellers head here to enjoy the beaches, explore the scenery, and stand the chance to spot someone famous. The following resorts are open and ready to receive you: St Bart Isle de France, Le Sereno, Hotel Manapany, and The Christopher. Enjoy the glitzy nightlife with trendy restaurants and nightclubs or spend the afternoon on a luxury superyacht. There’s much to do in St Barts. Oman is a haven for those who love the outdoors. Here you can gaze out across golden sand dunes, hike across mountain ranges or interact with turtles and dolphins. Oman also plays host to the exact opposite – the Empty Quarter which is the largest sand desert in the world. Here you can participate in unusual activities such as 4WD dune racing, camel racing, sand skiing and camel racing! Don’t forget to visit the Hajar Mountains and Ras al Jinz Turtle Reserve while there. Normandy is found on the Northern coast of France and has a rich historical past. Those who visit are astounded to see how Nazi Germany impacted on Normandy’s past. Here you will find over 20 cemeteries that are dedicated to honouring the livesof those killed in the war from Allied and Axis countries. In fact, the Colleville-sur-Mer cemetery features in the opening scene of the movie “Saving Private Ryan”. Make some time to visit the Utah Landing Beach Museum, The Musee du Debarquement, and the Hongfleur– just a few of the tourist hotspots. Ready to take your travels in 2019 to the next level? If you can’t visit any of the above locations, you could always take advantage of cheap Mango flights and keep your explorations local! Use our flight search feature to find, compare and securely pay for your next adventure. This entry was posted in Airlines, Best Places in South Africa, Destinations, Flight Specials, Mango flight, mango flight prices, SAA Flights, South Africa Flights, Tips and Advice, Travel Packages and tagged Mango flights. Bookmark the permalink.